The owner of the shop was the sweetest person and had the most beautiful shop. She always had antique dressers filled with European Linens. I really wish I could contact her and thank her! 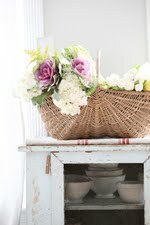 except for the pretty pale pink floral printed pillow on the bottom right hand side of the oyster basket. My Aunt Sonya (a.k.a. Aunt Mickey) actually shared a great tutorial on her blog, on how to cover a lampshade. Right now I just use a European monogrammed sheet to cover our down comforter. I like how clean and simple it looks against the rustic doors. We do not eat on our furniture and we take our shoes off before entering the house. I love that sort of rumpled look. The lavender scent is my favorite. You can read about it by clicking here! and I have been hooked ever since the first day of trying their cleaning products. I am now hooked on throwing those little sachets in the dryer with my linens. It includes 6 lavender sachets and a bag filled with 3/4 lb. lavender, made from an antique french and or European linen hand towel, so you can refill your own sachets. She really has a special touch she puts on every room. I am sure it won't be long before we see Rie's home featured in Country Living. I will be sure and show you in the near future what items we made for the shop with these beautiful french linens. I thought it would be easier to answer them in a post, as I have to apologize for not being able to get back to everyone lately.... I am having a very difficult time being able to keep up with my emails, and I am truly sorry for that. Nate Show on their website. I just assumed it would be put on their website. Anyway the entire trip to N.Y.C. was a trip my two daughters, two sisters, and I will never forget. I would like to thank these wonderful bloggers for posting about my shop this week.... I am so grateful for all of your support.... THANK YOU! Looove these pictures! May I move in? I also love anything with a monogram....very beautiful indeed. I am glad you enjoyed the big apple and hope you didn't get stuck in any one of our many snow storms! I could get lost in your home (photos of it) for hours. Each time I visit I find more details I love. The lamp shade is beautiful. So happy you enjoyed my home away from home - Manhattan. (Native NYer) Off to your lovely shop now. I can't imagine how soft those sheets must be after all this time! Can't find anything like that here in Australia. Great post! Your house and all the furnishings are to die for! Lovely, fabulous collection of linen. you are proof that we can! I posted about your shop this week....and so many people commented that they just love you and your shop! Your house is so beautiful, is amazing, Thank you very much for the tips and now I know thanks to you that we can have a white sofa. Awww, what a pleasant surprise that was Maria! Thank you so much for the incredible compliment. :) I love Mrs. Myers lavendar scent too. It honestly makes me SO HAPPY to smell it when I'm doing laundry. I've never tried the lavendar sachet in the dryer thing... I'll have to! THaNkS for ALL the GREAT LINKS and as Always ~ your Home/Style is just FaBuLous Maria!!! Lovelove love this post! Everything you do is so gorgeous! You have totally inspired me! Love everything you do, you are such a sweet person! 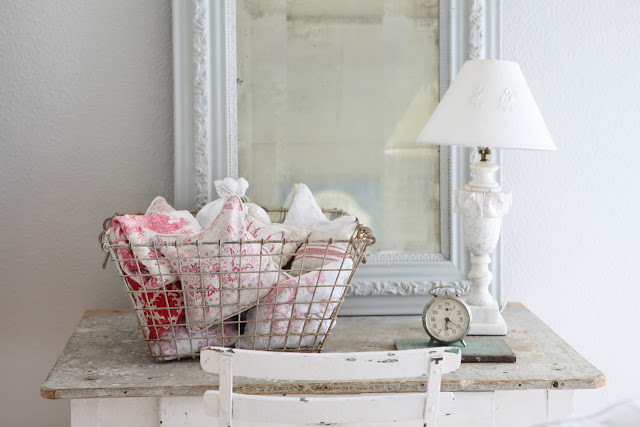 I share your love for old linens, I can never pass a beautiful piece whenever I see one and I understand you feel the same about these marvelleous handmade treasures! Thanks for making me feel good!!! I love what you have done with your linens...and think it is wonderful that you use them daily. Thanks for all the tips on how you keep your whites white! what an amazing collection. i can feel the softness of the linen. makes me want to come over and curl up on your couch. i just bought that laundry soap. thought i would give it a try. i like their dish and hand soap a lot. So beautiful! you have such a gorgeous home and I LOVE the way you photograph it...I bought ONE older monogrammed sheet from an antique store quite a few years ago...I don't use it that much, but it is gorgeous!! Oh wow!! This is such a wonderful post! The pics, the story...everything! I'm inspired now! Thank you. oh, so wunderfull pictures of light- and softness. I've lots of old white linens. My father in law is a big collector of old things. His house could be a every day fleemarket for years. And often I get linens and fabrics from him. Since I have one little white refugium for me and my husband - my bedroom - I'm using them really as bedclothes. And I'm celebrating washingday, really, I'm not kidding, I love to wash the old linens and fabrics. My mother always told me, how dificult it was in former times to wash. The wahsingroom was in the cellar, of a fivestoried house, the drying loft was under the roof. No elevator! After the linen was dryed enough, they sprayed lavender water on it, before ironing. And so do I: Every saturday! I'm washing my bedclothes, hang them up to dry, spray them with lavender water, iron them und cover my bedstufr again. It's not possible to get a fresher bed, than this. My other linens sleep in a board, they get fresh air, when ever it is possible. wow, sorry, thats half a novel now. Love these pictures. Thanks for the advice how to keep it clean and fresh. I have replied your email..just now.. I love Mrs. Meyer's products...I use them all the time. All of your linens are gorgeous! Have a wonderful weekend Maria! Maria! I have lavender sachets that I never knew what to do with! I didn't know that I could use them in the dryer! I'm so excited to hear this! I love this post a lot! Love the touches of red so much! It make me want feel like it's Valentine's day at your house! Just beautiful!! This was as helpful as it was pretty to look at it Maria! Your home is so restful feeling. 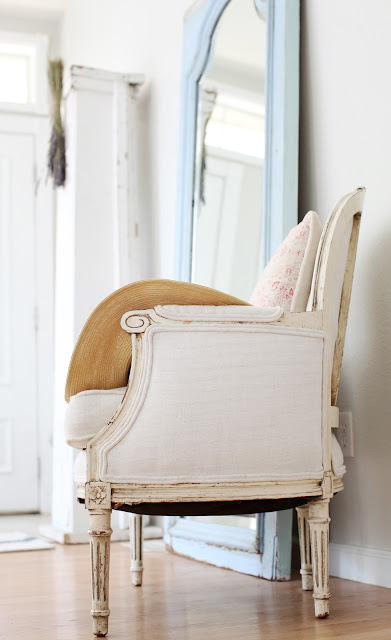 I love your style~I am considering upholstering an old chair in linen and you helped me make up my mind! So pretty! Thanks for the laundering tips too! 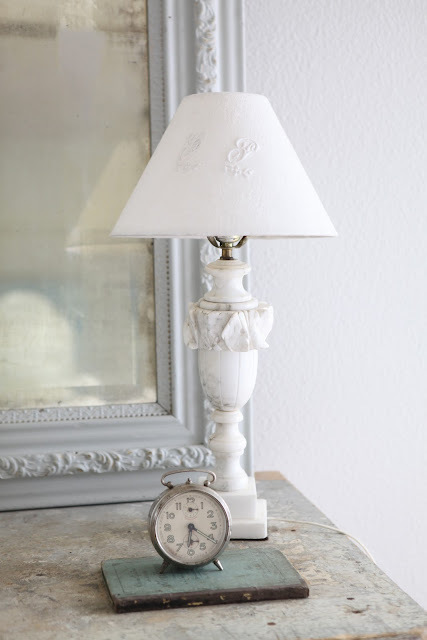 I just got an old lamp with ceramic roses all over it and I was wondering what to do for a lamp shade! Oh, your home makes my heart swoon! You are so sweet! You have so much going on in your life, but you take the time to answer all sorts of blogland questions and give us wonderful information. I've been reading your blog since last spring, and have enjoyed it so much. Congrats on all you've accomplished recently and THANK YOU for the inspiration & tips. Beautiful pictures and love your home! Can't wait to see what you make with those linens! Hey there! This post was a great way to 'come clean' about using oxiclean - I have been scrubbing a stain with my diluted asprin for weeks now and it's still there!!! LOL. Sorry! I'm bad. Love this post - your house is so beautiful! Hope you're getting lots of sunshine down your way. I'll be at the shop on Sunday if you get a chance to stop by! Thanks so much for your post...I was just drooling over all the lovely whites. I really want to use all white in my house but have been so fearful because of my three boys and a dog...Even though the dog isn't allowed to get on the furniture, she still rubs her body along side of the sofa and it's a little hard to get out dog oil, so I'm thinking maybe off white? I wish I had thought of putting a sheet over my creamy white slipcovers when my kids were young and my dogs were pups.I washed my slips to death and finally gave up and bought dark furniture.Now I'm going back to the look that I LOVE and I'm so happy.I love your home and could look at the pictures all day long. Thanks for all the information in this post! I have white furniture, and the only way it's possible is to keep it covered like you do. When you are looking at linens, how do you determine they are European or even antique? Old Linens are something that I would love to start a collection of. I love this post, so much information. I too, love the smell of lavender everywhere in the home. Your white couch is beautiful! Have a great weekend, hope to get together with you soon! Merci pour ces belles photos... Je possède beaucoup de vieux draps et torchons de ma grand-mère et arrière grand-mère. Je les garde précieusement, ils sont tellement beaux... Ma grand-mère était brodeuse et les avait brodés avec amour. Maria you inspire me so much! :) Thank you for sharing gorgeous photo after gorgeous photo. You have the prettiest couch I have ever seen in my life. :) And I love how you have it covered with French linens. I did not know about the Mrs. Meyer's article - I'm going to read that.. I think you make the Mrs. Meyer's company profits jump way up - I know I am going to add their detergent to my weekend shopping list. I've only used the hand soap & scrub before. Thanks for sharing all your eye candy with us and have a wonderful weekend! I gotta tell you, You take the most amazing picture. Your home is always a pleasure to visit. Your online shop is beautiful and will be buying some thinks in the spring. 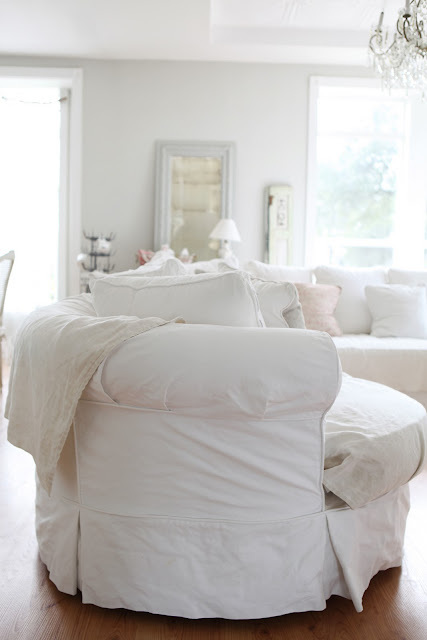 I have all white slipcovers EVERYWHERE and I wouldn't have it any other way. very easy to keep clean. I have two dogs and one cat and people in and out all the time. Love your post today. Happy Weekend. Your style and taste is divine! I love your collection of vintage french linens...wish to have one of my own someday. You are such an inspiration with your design...love it! ;) I too love red with white...and as much as I love white, could not live without having color as well...you do this so beautifully. I have a question about your couch...where did you buy yours if I can ask? We are looking to buy a sectional for our large family in the family room and I want to do a neutral slipcover...we too have a rule of no shoes in the house and eating on furniture. That is the only way I can have white in my home with 4 boys! lol ;) Thank you for sharing again such a beautiful post!! Your home is drop dead gorgeous, Maria. You have done such a lovely job. I want to keep my eye out for antique French linens now and start a mini collection. You have inspired me. I love the lampshade your mom made. The first purchase I made on Ebay was an alabaster lamp. I have a burlap shade on mine with a ruffle that I had made but I'm liking your white linen one. Your couch looks so cozy and comfy. Have a great weekend. You are such a very talented girl, Maria. 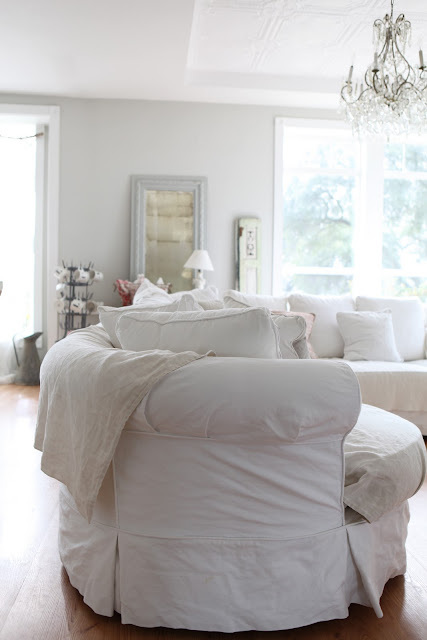 I am so inspired by your blog and you have given me a great idea with those linens on the white couches. I feel like I am forever washing my white slipcovers, but now I'm trying my linen tab curtains to cover them. Yay, I'm excited!! Thank-you so much!! I'm a collector of vintage french linens as well. I used to use this fabulous laundry soap from a gift shop by my house on all of my vintage linens. It made everything smell like violets! It was so wonderful. Now I can't find it anymore, so I just went out and bought me some Mrs. Meyer's lavender detergent. I've used the cleaning products for years, but I've never tried the detergent. Thanks for recommending it! Your photos as usual are just gorgeous!! Congrats on the shop doing so well! No hurry on getting back to me, I know you're catching up. Just wondering if you will carry the lavender/poppy seed soaps? That lavender laundry bundle is LOVELY. Thanks for having great taste, Maria! 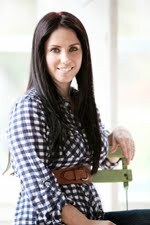 I just stumbled across your blog and your home is drop dead gorgeous!!! Darling Maria, thank you for show us how many things we could do with some linen! I have one big enough to cover a chairs, I didn't think to do somethng like that!! Darling, your home is simply stunning, and every image brights my eyes: I saved soooo many!! I would like to invite to visit my family's company online at www.pioneerlinens.com. Pioneer Linens is a fourth generation family owned and operated since 1912 luxury bedding and home decor store. Thanks for all the tips Maria! I love my little lavendar sachet you sent me...even my son will pick it up and smell it every now and again!! Maria, can i tell you how much i love this post! I am getting ready to redo our master bedroom & have been looking for bedding. i simply adore white linens but have 3 children, a husband & 2 dogs... one of them is a black lab. this post has encouraged me to just go for it! and just have a couple of rules with it. and, believe mem i wish i had stock in oxi clean..
What a lovely blog. And how you inspire people. I will link to you - from my blog. 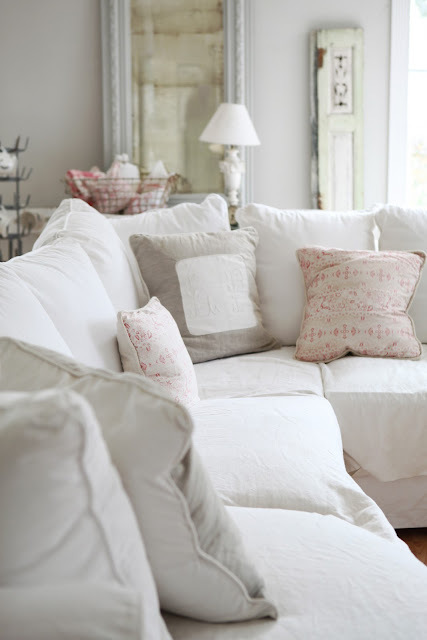 Thanks for all the information on the linens and how you keep the white white :) Your sofa is just beautiful and I love the linens spread out on them! Have a fabulous weekend, Hope your enjoying the sunshine! I collect vintage linens too!! I love them! I also love your idea of throwing lavender bags in the dryer. What a great idea! It's great! I just bought my first Mrs. Meyer's product this last week. I'm eager to check out more of it. 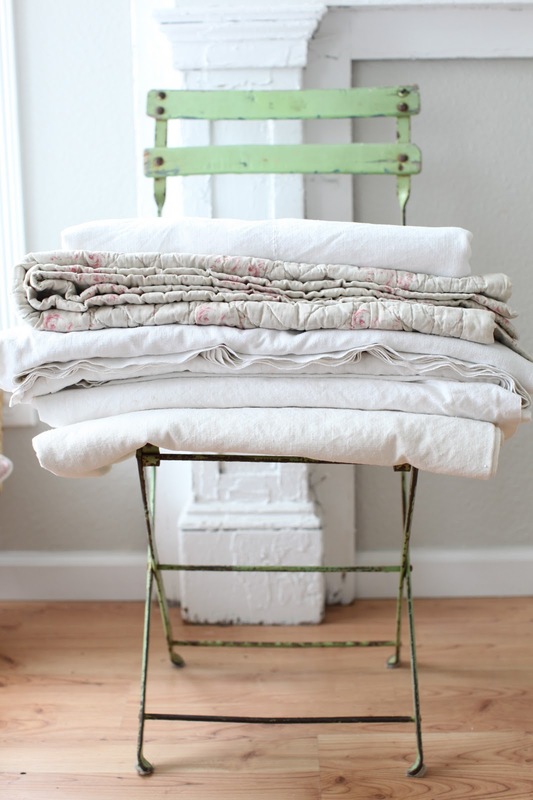 There is nothing better than antique linens! I sold a ton of them...back in the day. Many thanks for such a stunning blog! I just received a beautiful lavender scented package from you today. I found your website earlier this week and instantly fell in love. I am going to order from you again soon! I will truly enjoy my French canning jar and lavender sachet. Thank you so much, and I can't wait to see more of these European linens, I am swooning! 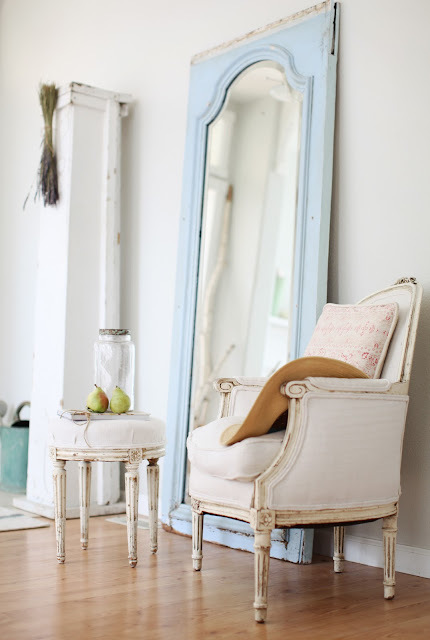 it's always a great pleasure for me to visit your blog and see your lovely interieur and your nice pictures! Hi Maria ! this is a great post about what I also love, french linen sheets with monograms, I am colleting them because we can found these a lot here in France on every brocante. I love to make curtains with these sheets without cutting them ! Your home is gorgeous and you are a brilliant photographer! Thank you for taking us inside your lovely world! Gorgeous!!! I love that blue mirror, the white lamp & lampshade, as well as the wood at the head of the bed. A white theme makes these things stand out really well. Great job! Oh my gosh! 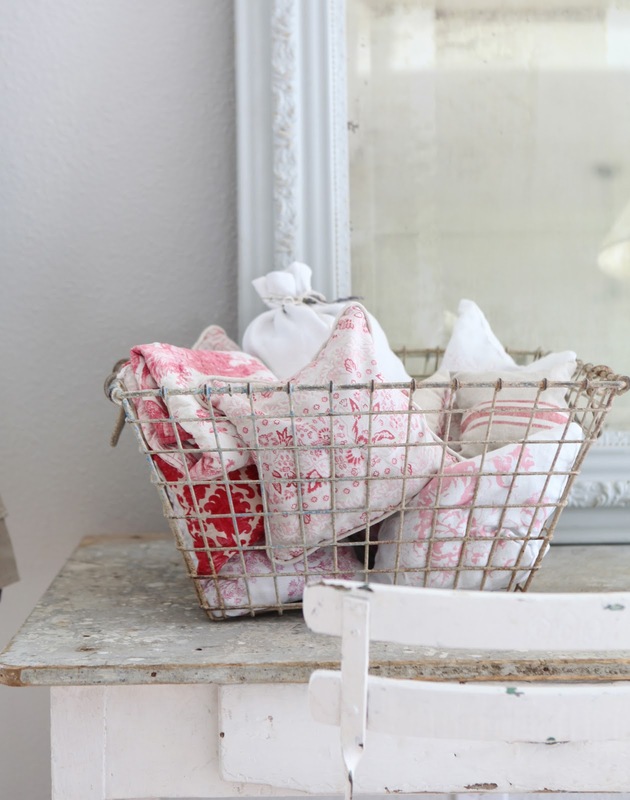 I just love your blog ... and all your linens! I have been collecting linens for some time but I don't think my stash comes close to yours! Maria, I am loving your photos!, your home is so lovely, I can't imagine how you manage to have it so lovely with 5 kids!! kudos!! I am so in love with your chandeliers! !, I wished I could fond one like it for my dining room. Maria, I so want to have a white couch...but I'm afraid-:). I just can't see my two guys following the rules. But maybe I'll try. Maybe. Beautiful photos, as always! Thank you again for the time and effort you put into these posts. They are beauty personified !!! I live in Australia where we don't get the Nate Berkus Show, so I have been stalking their website hoping to catch a glimpse of your segment. Can't believe they arene't going to put it up !! Can I suggest that we stage a peaceful Ghandi-like attack and all LOVINGLY contact the Nate Berkus show requesting Maria's segment be put-up?? All those in favour say AIH !! I am enjoying your blog!! I noticed that you recommend the Mrs. Meyers products. Do you use the detergent on towels?? Does it work well or does it get the funky smell that other liquid detergents create? Love everything about it...so warm and inviting!! Love seeing your world, as always! 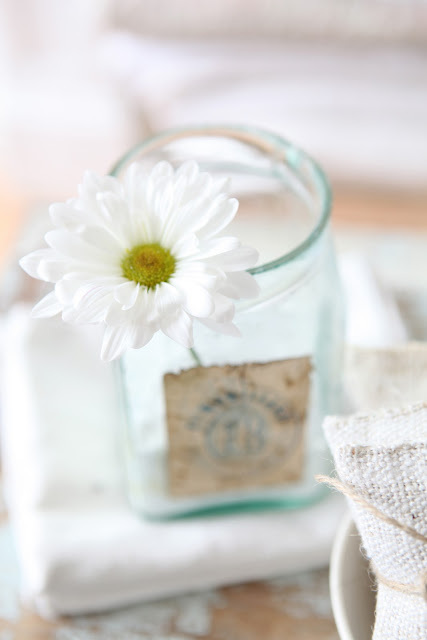 love your post and your love of vintage linen. Living in Ireland, as a child, I remember the linen lying on the bleaching greens and left out in all weathers to bleach the linen from a beige colour to dazzling white! This still works to-day and the elements remove and=y stains....or is it the soft Irish rain!! 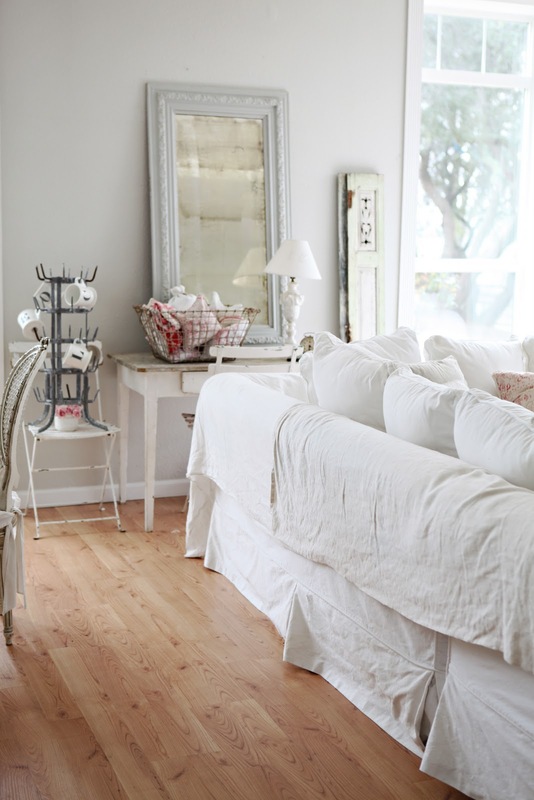 I just found your blog today and I love your home...just beautiful. I am looking forward to reading more. What a breath of fresh air! Your children and husband must love having such a creative mother/wife and being the lucky recipients of your simply elegant style. I can see your passion for design in every detail. I'll be back for more. awww, what wonderful pictures, just GREAT, I love them !!! Love your home, love your style, and love all your gorgeous goodies!!! You have a real flair! Everything looks so comfy cozy...I'm drooling. OMG, this is beautiful!!!!! I love everything you have. I found your site while doing a little blog hopping:-) I just love whites and off white and yes I have animals but do not care. I will definitely be a follower. Thanks so much for sharing so much beauty. 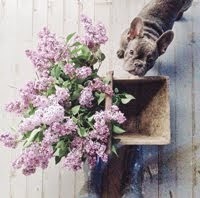 I am doing a post on lavender tomorrow and am going to feature your new shop and lavender products...if that is okay? I saw your beautiful home at Home of The Month of A Painted Cottage...Oh how I loved seeing your other living room with two white sofas. And I was so suprised to see that your favorite shop is Le Jardin in Sacramento...I know where that is. I live in the country suburbs of Sacramento. Did you ever go to Le Petite Paris in downtown Sac? It was my favorite shop and cafe but they had to close their doors at the end of the year. I cried. So sad. They were the nicest couple and their daughter Bella always chatted with us. I miss them so much. 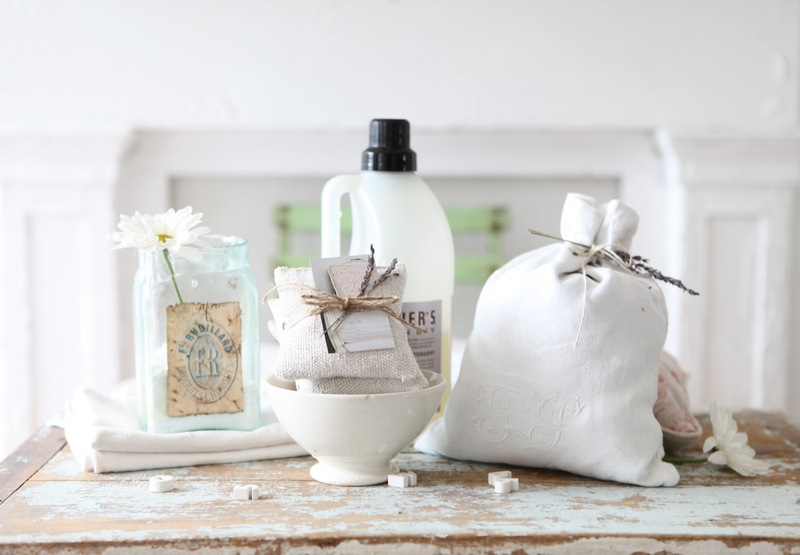 Thank you Maria for suggesting Mrs. Meyer's lavender laundry detergent - I recently bought it (after reading this post) and I am really enjoying the lovely aromatic scent! It takes laundry upkeep to a whole better level! I had to come back and thank you! This was truly beautiful! Thank you for the amazing blogpost..so inspiering! 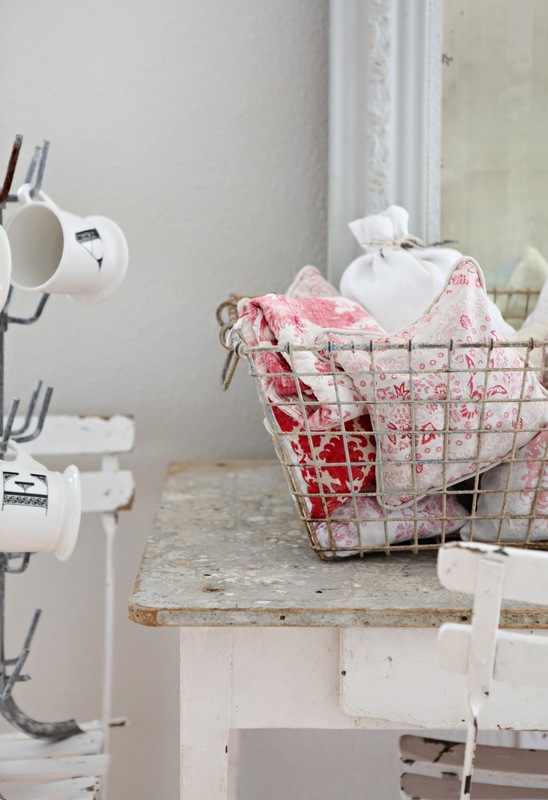 sO beautiful and I adore the idea of handmade dryer sachets- great idea. I am going to try this tomorrow! Love your article in artful blogging and there in the images was that gorgeous blue cupboard that taunts me! I love it so much. Thank you for sharing your linens and white. I have recently had white slipcovers made for my sofa and chairs and, like you, do not have a washer large enough to wash the sofa cover. The first week someone sat on it with black shoes and made marks along the skirt edge, darn it!! I noticed you remove your shoes, probably to prevent such happenings - good idea. I've never expected company to remove their footwear but now think I may have to........will they think me rude making such a request? I too love European linens and have have several items including French and Belgian sheets, grain sacks, tablecloths etc. Your blog and home are beautiful Maria - I'll continue visiting for inspiration. absolutely LOVE your home. so comfy and homely and simply beautiful! have shared a few of your photos on my blog and spreading the word about your blog here in south africa... hope you don't mind! I realize this is a little random, but what kind of flooring do you have in your home. It is beautiful. Is it oak, or pine, or something else? I love the grain and light color. It's perfect in your photos. So inspiring I feel that spring is already here! Thank you for such gorgeous images. Hi Maria! Just wanted to let you know you inspired me! I don't yet have the awesome linen collection but you gave me the courage to go with white for this post! Love your home. It's so clean. Quite an inspiration. I live in Santa Ynez and worked in Persnickety for fun. I also made a lot of the pillows, aprons, and some slipcovered items for the store. It was such an adorable place and I know Patti, the owner, would appreciate your comments. Maria~ I have been to Persnickety & am disappointed it's closed. I was a big fan. The garden store down the street is awesome also, but I'm not sure if it's still there?? I was married at Gainey Vineyard. hi. i just stumbled upon your blog today. your home is beautiful. i was wondering where your white couch is from. i've been debating getting one and yours looks awfully comfy. I have new Italian linen sheets and I've never used linen sheets before. I washed them twice in cool water with Mrs. Meyers soap. They feel pretty scratchy compared to percale. Is there a way to "fast track" them into being really soft? They were an extravagant wedding gift and we'd love to use them but they just are not comfy. Help! Any suggestions since you're a linen expert? Thanks!! I love that sofa!!! EXACTLY what I want..... where did you get? or where can we get one similar?!? 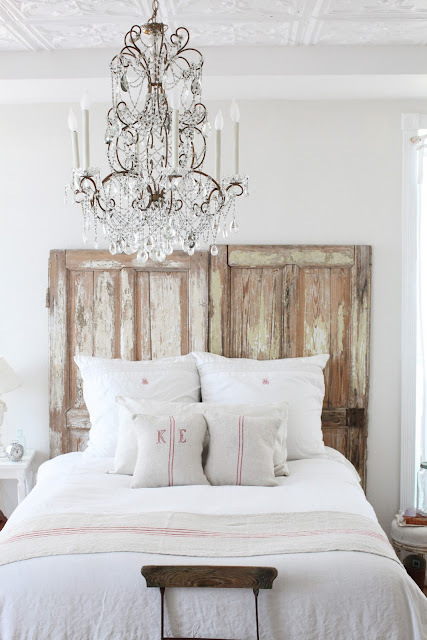 I hope you don't mind but I posted a picture of your bedroom idea with the old doors on my blog today. I have linked back to your blog and also added you to my "Beautiful, Inspirational Blogs" on my side bar. I am sorry I could not find your email address to enquire if this is ok. If it is not I will remove it. I think I have seen your photo re the old doors at the top of the bed, in an interiors book or magazine. I am happy to link to the book or magazine if you like if you can give me the title. Your house is AMAZING! LOVE the sofa! hermes outlet birkin hermes belts authentic prada handbags green red bottoms pumps hermes outlet belt celine trapeze sale . May I simply say what a comfort to discover somebody that genuinely knows what they're talking about on the net.